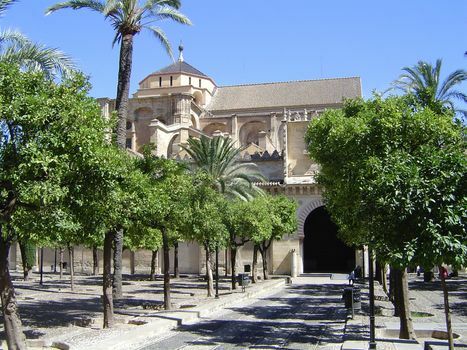 The chief monument of Cordoba is the mesquita, a Spanish corruption of masjid, corrupted in English to mosque. 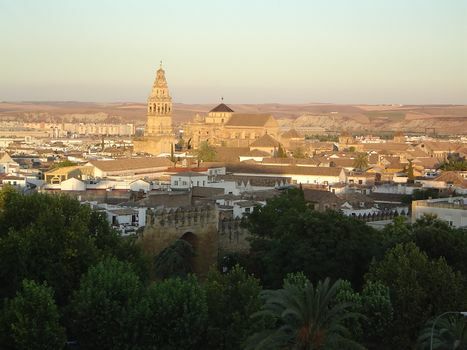 The view over the Juderia, with the Puerta de Almadovar in the foreground. Smack in the center is the cathedral, which was built literally in the middle of an immense Friday or congregational mosque. Charles V is supposed to have deplored the change--is supposed to have said: "You have destroyed something unique to build something commonplace"--but Charles did much the same thing himself with the palace he put cheek-to-jowl against the Nazrid palaces of the Alhambra. 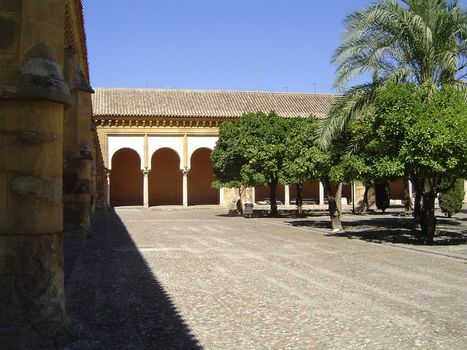 Besides, the mosque was built on the site of the Visigothic Basilica of San Vicente, purchased and razed by Abdel Rahman I, and the basilica had earlier replaced a Roman temple. The cathedral builders also added a bell tower on top of the mosque's massive minaret. 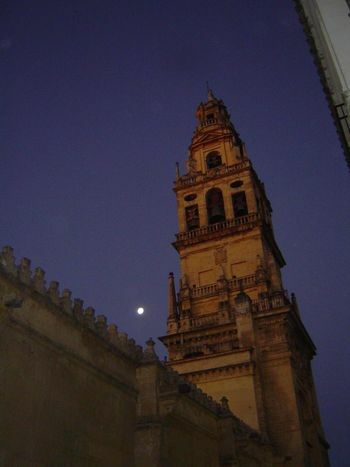 Both the tower and the cathedral-in-the-mosque dominate the old city. Up close, you can tell where the minaret stops and the bell tower starts. The mosque and the enclosure in front of it are both rimmed with a massive wall. Another view of that wall, on the qibla or Mecca-ward side of the mosque. The city wall is just behind the camera; the entrance to the mosque is all the way around on the opposite side. Note the inverted "U"s or alfizes draped over the doors of both buildings in the foreground. They mimic the much grander one in the mosque. The Gate of St. Steven, the best preserved of the wall's 19 gates. 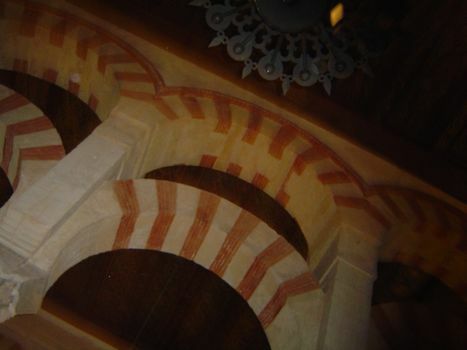 Parts of it date from the reign of Abdel Rahman I, the first emir of Andalucia; an inscription on the tympanum says that the horseshoe arch was finished about a century later, in 855. Note the arabesques carved into the alternating sandstone voussoirs. Inside the enclosure, the Patio de los Naranjos ("Patio of the Oranges"), 210 by 430 feet. Christians after the Reconquest brought in the oranges that give the place its name. Another view of the enclosure, this time looking to the mosque and, rising within it, the cathedral. In the days when this was a functioning mosque, there were no walls or doors separating the mosque from the patio. The walls came later, with the conversion to a church, and they explain why the interior of the old mosque is now so dark. In addition to daylight, the mosque had over 200 chandeliers with seven thousand cups of oil. Al-Makkari, who describes the mosque at great length, gives appallingly minute details about such things as the oil consumption of the lamps and the quantities of cotton used for wicks. He then concludes with a cautious, "But God only knows." 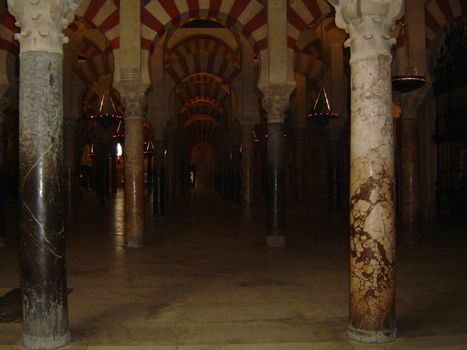 At first, under Abdel Rahman I, the mosque consisted of arcades forming 11 naves and 12 bays--all told, 110 columns covering an area of about 70 meters by 70 meters. 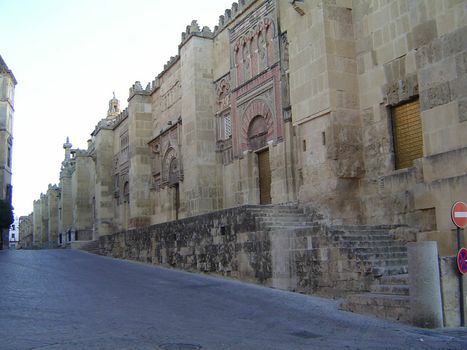 In 848, Abdel Rahman II extended the length of the arcades by pushing the qibla wall back by a distance of eight arches and almost doubling the number of columns, to 200. 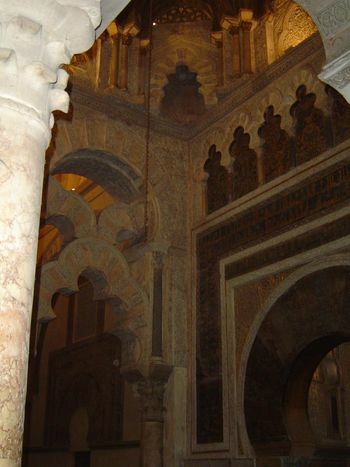 In 961 Al-Hakim II pushed the qibla wall an additional 12 arches still farther back, increasing the number of columns to 320 and adding the famous mihrab, or prayer niche. In 987, al-Mansur, who served two caliphs, added another eight naves, creating a mosque of 544 columns covering an area of 130 by 115 meters. The view here is down a bay, perpendicular to the naves and intervening arcades. Ford, ever acerbic, comments on the scavenging that had brought columns here from Spain, France, North Africa, even Constantinople. Many were too long; rather than being cut, they were deeply buried, prompting Ford to comment that the Muslims treated the columns the way Procrustes treated men. The columns support double-decked arches--the upper circular, the lower slightly horseshoe-shaped. It's a design adapted from Roman aqueducts such as the one at Merida, which also alternates brick and stone voussoirs in a pattern called ablaq in Arabic. 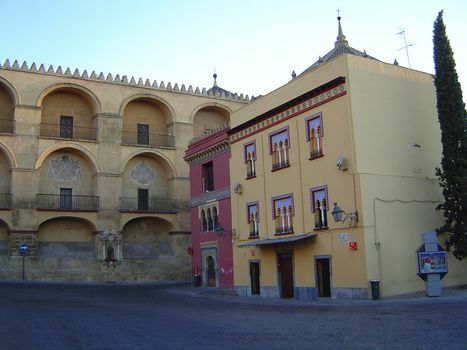 The horseshoe arch, so associated with the Moors, was also an adopted form, in its case taken from the Visigoths, who had used it in churches such as San Juan de Banos, built in Palencia about 660. A detail of the stacking. Near the mihrab, or prayer niche, the stonework becomes much more elaborate to define or indicate the maqsura, the enclosure reserved for the sovereign. Islam makes much of the egalitarianism uniting the umma or community of believers, but the opulence of this part of the mosque belies that ideal. 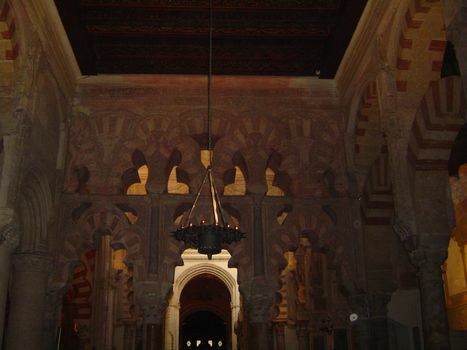 The view here looks toward the brightly lit cathedral; the mihrab is behind the camera. 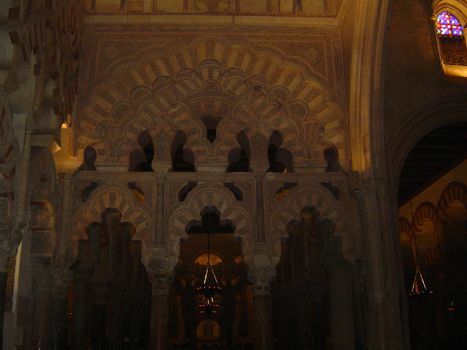 Multifoil arches screen the maqsura. 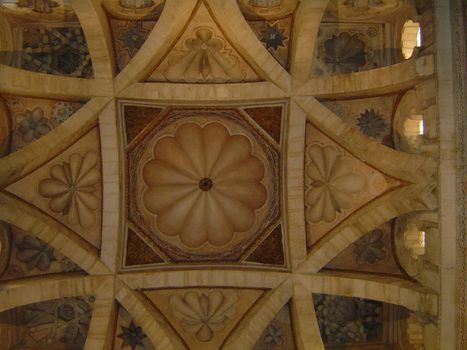 Overhead, the maqsura is roofed by four complex domes; this one is the Capilla de Villaviciosa. Unlike domes in the tradition of European cathedrals, the ribs in these domes do not converge at the center. 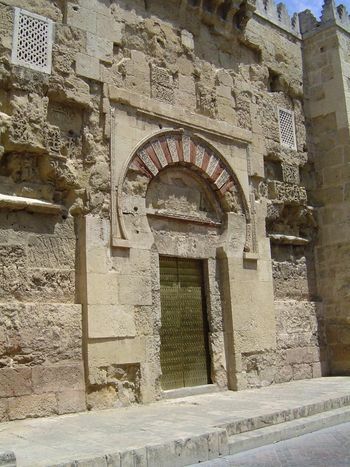 The mihrab, with a horseshoe arch surrounded by an alfiz, that distinctive U-shaped band of trim,in this case ornamented with squarish Kufic script. This mihrab is unique in that it leads to a small, octagonal room. 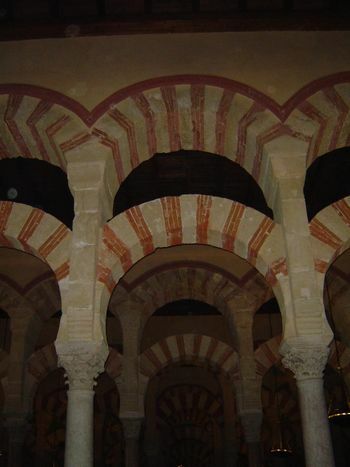 Jerrilyn Dodds argues in Al-Andalous: The Art of Islamic Spain (1992) that this was an unconscious adjustment by the regime to the flood of recent Spanish Christian converts, whose churches had included liturgical spaces like this. The room was intended to be dark, and indeed the figures appearing in the room are invisible without a camera flash. The words in the bar directly above the mihrab specify some of the 99 attributes or names of God. The lines above the bar and forming the top of the alfiz include Surah 40:14, which urges the faithful to call upon Allah alone and to act for his sake, rather than from vanity. There is more, though. Part of the importance placed on attendance at Friday or congregational mosques arises from the need to reinforce the legitimacy of the local ruler. 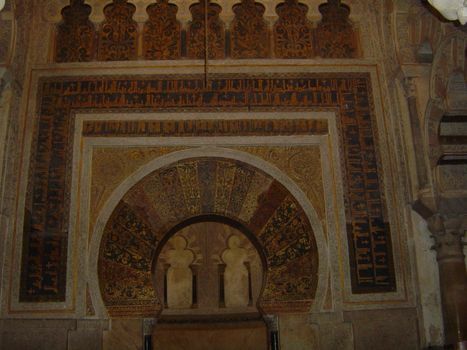 Part of the inscription around the mihrab does just that, with the non-Qur'anic: "Praise be to God, master of the world, who favored al-Hakam II, the servant of God, the prince of the faithful...."
A new mosque opened in Granada in 2003. Its mihrab is a simplified copy of this one: the proportions are right, but there's almost no ornamentation. The mihrab is shown here at an angle to hint at the opulence of the maksurah. The mihrab in other mosques is built in a wall perpendicular to the qibla, or direction of Mecca: the faithful can face the mihrab and not have to worry about whether they are praying in the right direction. Cordoba, though, is a rare exception to the rule. Some authors state this as a fact and leave it inscrutable. Others explain that the mosque's builders were the last of the Ummayads, driven from Damascus. The qibla they adopted points not in the direction of Mecca, therefore, but in the direction of Mecca from Damascus. Rather than pointing east by southeast, prayers here were offered to the south, as though the Ummayads had never left home. Al-Makkari seems to agree with this interpretation. He writes that at the time of the second expansion (which included construction of the present mihrab) the mosque's builders were at a quandary "respecting the part of the horizon towards which the kiblah was to be turned; some pretending that it ought to be built facing the south, as it was formerly, and as his father, An-Nassir, had done..., while mathematicians and astronomers contended that it ought to be built inclining a little towards the east." The matter was settled when a scholar approached al-Hakem and said "O Prince of the believers! all the people of this nation have constantly turned their faces to the south while making their prayers... Remember that proverb which says, 'It is preferable to follow the example of others and be saved, than to perish by separating from the track.'" The caliph replied, "By Allah, thou sayst right!" 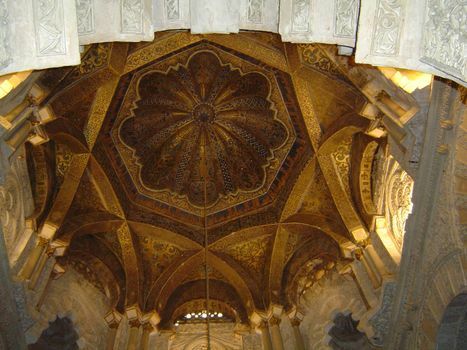 The gorgeous dome in front of the mihrab. It's brightened by mosaics set by workmen who came from Constantinople with orders to do here what they had done earlier in the mosque at Damascus. Again, the ribs do not converge but form a polygon. Spectacular as it is, al-Makkari describes vanished glories that he calls greater still. He mentions a "pure gold" door into the maqsura and says that "the floor of the makssurah was paved with silver, and... all the parts adjacent to it were covered with sofeysafa (rich mosaic work intermixed with gold); and... most of the columns, which are described as being placed in clusters of four, and having only one capital, were most beautifully carved and inlaid from top to bottom with gold and lapis-lazuli...." He also describes a vanished pulpit "built of ivory, and of the most exquisite woods, such as ebony , sandal, bakam, Indian plantain, citron wood, aloe, and so forth, at the expense of thirty-five thousand seven hundred and five dinars...." Another writer, he says, reported that it was formed of 36,000 small pieces of wood, "fastened together with gold and silver nails, and occasionally incrusted with precious stones...." Al-Makkari then adds the prudent and standard disclaimer: "...but God only is all-knowing."